Akademie #2 - Überwinde Dich! Teilnehmer*innen der Akademie können zudem Tickets für die Showcase-Veranstaltungen am jeweiligen Tag zum ermäßigten Preis von 5 € erwerben. Der Aktionscode hierfür steht auf dem gekauften Ticket für die Akademie. 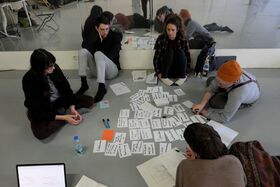 In many places targeted work is being done of improving working conditions and outcomes in the independent theatre scene – through lobbying, evaluation and additional training, through critiques of existing power structures and feedback techniques in the artistic process. These developments can be regarded as a professionalization and empowerment of the independent theatre and its practitioners but also as a form of optimisation in competition for funding and programming space. In several days of workshops and a conference, the Academy will investigate various dimensions of such current developments and ask how these affect the self-image and actions of theatre professionals as well as their artistic results.